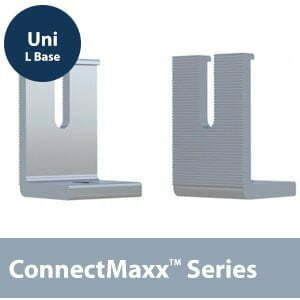 SKU: ConnectMaxx-TRUV-LBASE. Category: SunMaxx Solar Hardware Components. Includes L-Feet, but does not include the bonding hardware for fastening the L bracket to mounting rails. The bonded L-feet are engineered for most roof mounting applications. Vertical slots allow for easily dropping in rails with pre-attached hardware and provide adjustability to account for roof irregularities. Manufactured using 6000 series aluminum.